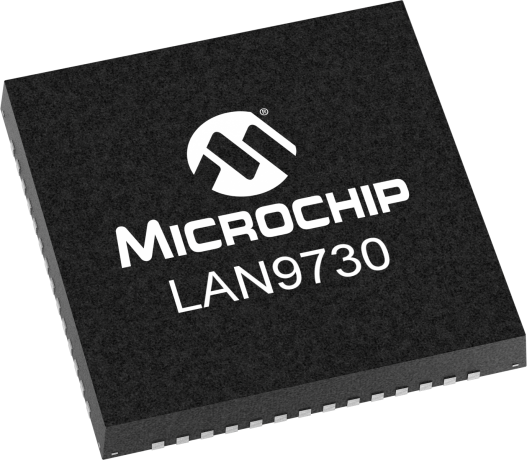 Microchip's LAN9730 was specifically designed to provide a high-performance, low-cost USB to 10/100 Ethernet connectivity solution with a Hi-Speed Inter-Chip (HSIC) interface. Taking advantage of the broad availability of existing USB drivers and software, Microchip's proprietary HSIC technology incorporates a 2-pin digital bus that enables the use of USB as a low-power, chip-to-chip interconnect at speeds up to 480 Mbps. The internal device controller is USB 2.0-compliant and the HSIC interface is HSIC USB Electrical Specification Revision 1.0-compliant. The device implements Control, Interrupt and Bulk-in and Bulk-out USB endpoints. Microchip's UniClock™ technology simplifies the clocking scheme and reduces system BOM costs by using a single 25MHz crystal for both USB and Ethernet connectivity – without the need for additional components when adding USB hubs.